In a dramatic week for world football, Sepp Blatter, the President of FIFA, gave himself a red card and announced his resignation, and Chris Christie declared his goal of replacing him. "I have always believed that I would make a great President, so for the benefit of the people of New Jersey, America and the world, I will be formally announcing my candidacy for the Presidency of FIFA as soon as I'm done eating. " "I have to tell you guys that I would be the perfect person to replace Blatter. I appreciate that a deep knowledge of football is essential for this job, and I have it! I've been watching the Cowboys, the Giants and the Eagles my entire life and I will bring all that know-how to the table for the benefit of American football fans throughout the world. I also hear that running FIFA is like running the mafia. That's awesome because I'm the Governor of New Jersey for Christ sakes, so enough said about my qualifications in that regard. Additionally, I know that the new head of FIFA must have a lot of experience dealing with the US Department of Justice in ongoing criminal investigations. Well, guess what? I've been doing that for well over a year now! Most importantly, I believe FIFA really needs someone to build all the bridges that have been burnt during this entire fiasco. And as I'm sure you will agree, whenever anyone thinks of bridges nowadays, they immediately think of me!" After his announcement, Christie did not immediately respond to questions from reporters, citing an urgent need to finish his doughnut. In further developments, other republican FIFA presidential hopefuls also declared their candidacies, notably Rick Perry, Scott Walker and Sarah Palin -- the latter of whom called the decision to give the 2022 World Cup to Qatar, "the worst supreme court ruling since Roe v. Wade." 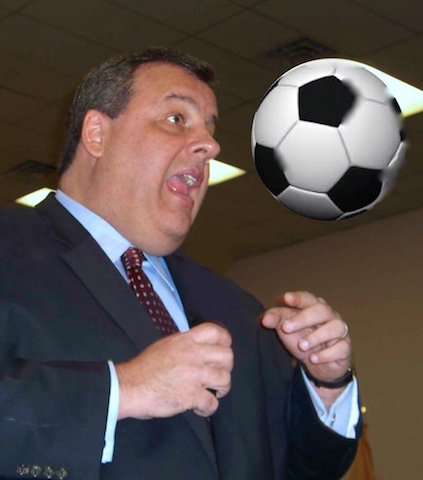 No matter who else throws their hat into the ring, Christie is likely be the most appealing candidate to FIFA sponsors such as McDonalds, Burger King, Wendy's, Pizza Hut and Kentucky Fried Chicken -- particularly given his extraordinary rates of consumption. However, when contacted for comment, Irma Crook, one of the few remaining executives at FIFA, said: "Chris Christie wants to become the new President of FIFA? Oh my God, quick! Let's get Sepp Blatter back!"